Mercure Glasgow City Hotel is a 3-star hotel close to the vibrant hub and cultural attractions of the city. 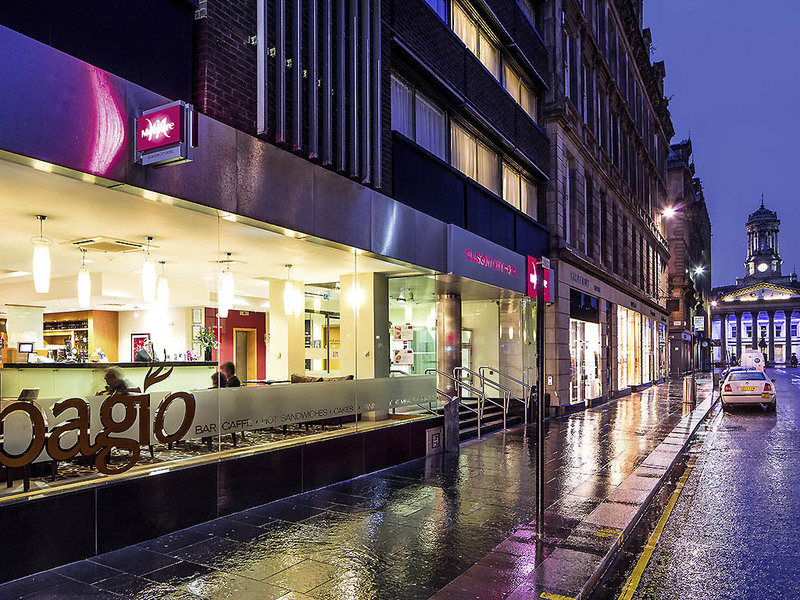 This Glasgow hotel is perfectly located for a shopping spree in Glasgow's upmarket Merchant City, while guests are free to explore many nearby cultural landmarks. Just a few minutes' walk from Glasgow Central and various other city centre stations, its convenient location makes it the obvious choice for events, special occasions and more. The Mecure Glasgow City hotel is half a mile from Glasgow Central railway station, within 5 minutes walking distance from Queen Street Railway and Argyle Street Rail. Glasgow Royal Concert Hall and the classy shopping of Buchanan Street are within a mile. All bedrooms feature a flat-screen TV and complimentary high speed WiFi. In privilege and superior rooms you'll enjoy a Nespresso coffee machine, newspaper, robe and slippers. Upgrade to our superior room with views of Ingram Street and a four-poste r bed. Ingram Street Café offers a variety of light meals and snacks. For a full evening meal, you are spoiled for choice by a broad selection of restaurants and cuisines just seconds from the hotel. For a lighter meal, room service is available 24 hours a day. Bagio café bar offers a variety of light meals and snacks. For a full evening meal, you are spoiled for choice by a broad selection of restaurants and cuisines just seconds from the hotel. For a lighter meal, room service is available 24 hours a day. Otel cok eski, yenilenmeye ihtiyacı var. Odalar cok kucuk.